We are now 48 hours away from opening the First World War nursing exhibition, and the fun is getting fast and furious! 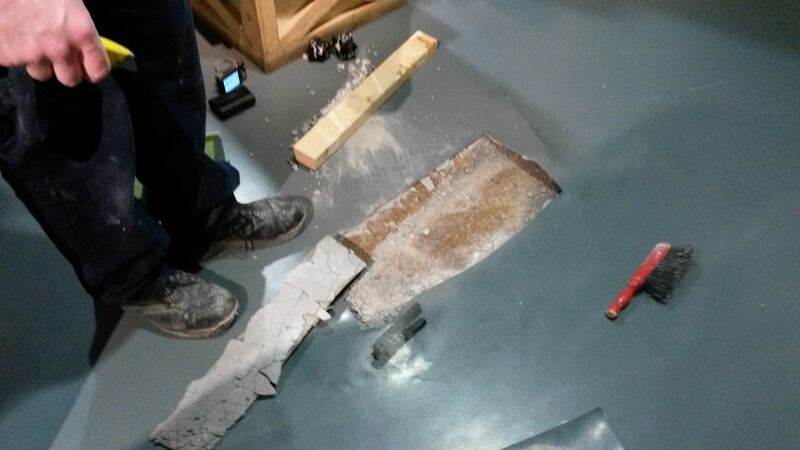 Our carefully worked out schedule for installing the exhibition has been rewritten several times, as one cancellation can create an alarming knock-on effect. But it’s been an exciting week – the agonising over the colour scheme was worthwhile as the exhibition room is now painted a lovely pale blue, with interpretation panels of a rich corn colour. The belongings of the First World War nurses are beautifully arranged in the display cases, and the archival material is up on the walls. The last thing to go up is the ten oil paintings that will form the centrepiece of the exhibition – and then we are good to go! As I write, members of the team are obsessively wiping non-existent marks of the glass of the display cases, and straightening out objects by a fraction imperceptible to the human eye. 1. Always factor in more time than you think will need. Buffer zones are your friend! 2. If lenders allow it, collect loaned items early so you have them on site. 3. Prioritise marketing above creating the display – journalists will lose interest in a millisecond and you may never get that chance of coverage again. 4. Face the fact that all other areas of your work will be seriously neglected, and just hope to catch up later on! In preparing for our exhibition about First World War nursing, one of the nicest things we have found is the interest and support of the families of these brave women. 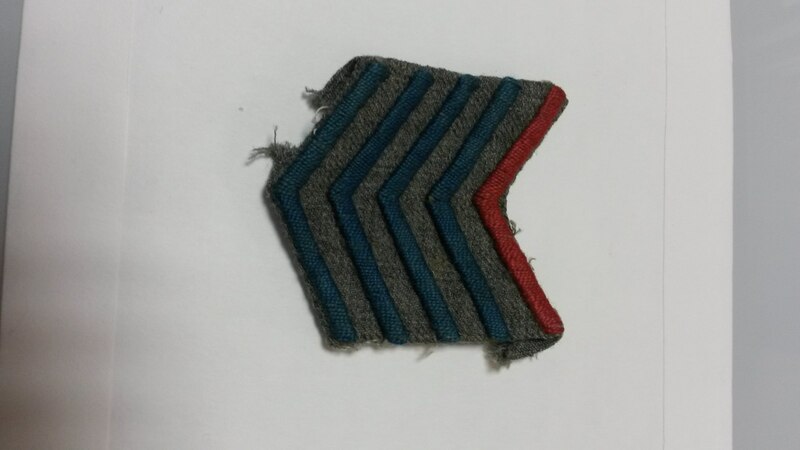 The exhibition will tell the story of one field hospital in northern France, run by the Duchess of Sutherland, and we have tried to trace as many of the relatives and descendents of the people who were there as possible. I admit that we didn’t expect to find many – or even any! – family members who remembered the staff at the hospital in the oatfield. In the summer of 1915, the Duchess herself was middle-aged, as was the artist Victor Tardieu who painted the hospital camp in a set of beautiful oil paintings that form the heart of our exhibition. How wrong we were! First of all, the dealer who sold us the paintings, the erudite and extremely kind Philip Athill of Abbott & Holder in Museum Street http://www.abbottandholder-thelist.co.uk/ put us in touch with the grandchildren of the surgeon who had worked at the camp. His grandchildren (one of whom is a doctor herself) remembered their grandfather clearly and fondly. Best of all, they have loaned us two albums that contain numerous photographs of the hospital camp taken by their grandfather, a keen amateur photographer. These have added a wonderful dimension to the exhibition, as many of the photographs capture everyday life of the nurses and their lives at the camp. We are also thrilled at the enthusiasm of the family of the Millicent, Duchess of Sutherland. Her granddaughter, the Countess of Sutherland, kindly shared her memories of her grandmother, with whom she was very close. It was a real thrill to meet someone who knew well Millicent Duchess of Sutherland, and who was able to confirm that she was indeed an extremely strong-willed and determined person! 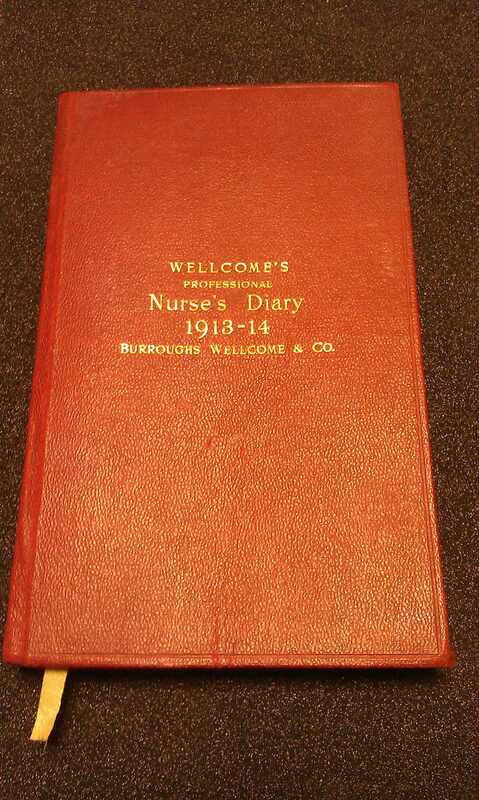 Wellcome’s Professional Nurse’s Diary 1913 – 14 – Produced by Burroughs Wellcome & Co. The Florence Nightingale Museum team have had an exciting morning visiting the Museum at the Royal London Hospital and collecting the wonderful items about First World War nursing they are kindly lending us for next month’s exhibition. All of the objects have such a strong historic resonance, but this little book really caught my eye and repays closer inspection. This is an ordinary pocket diary for a working nurse, only 15 cm high so it would easily slip in a bag or a pocket. The flyleaf tells us it belonged to Lillie Radcliffe, and her address was Nurses’ Home, London Hospital, Whitechapel, E. Perhaps the winter of 1913 – 14 was similar to the winter of 2013 – 14, as she has written down the side of the flyleaf “Without sunshine, a girl withers.” As well as the usual pages for appointments, this little book contains chapters to help the professional nurse, on subjects such as Midwifery and First Aid for Nurses. Being a production of Burroughs Wellcome, it is also liberally scattered with advertisements for their products, mainly from their famous Tabloid range. Perhaps most intriguing are the notes Lillie made herself at the back. She diligently noted down all the books she read over the course of the year (ranging from The Little White Bird by J M Barrie to She by Rider Haggard.) Lillie has also noted down all her plans for her Christmas shopping, so we know that she intended to buy Mother an ebony brush and comb, and Gertie was to receive a Duchess set and table centre. The difficulty is we now have to choose which page to have it open in when it goes in display when the exhibition opens on March 13th! So many of the pages are fascinating it will be very hard to select one. Our thanks to Jonathan Evans at the Museum at the Royal London http://www.bartshealth.nhs.uk/about-us/museums,-history-and-archives/the-royal-london-museum/ for this window in a nurse’s everyday life 100 years ago.